Featured on The Eric Metaxas Radio Show! Across the globe a “revolt” of sorts is taking place against elitism. No more will big government, big media, big banks, big bureaucracy, and big institutions hold the secret nuggets of truth and dictate our lives and fortunes. Financial markets, political punditry, and cultural leaders are all scrambling to react to the rise of the often disenfranchised. But what happens after all the bogeymen have been vanquished? What if opposing the incompetence of the European Union, the biases of the American media, the corruption of crony capitalism, the arrogance of political power brokers, and allegedly unfair global trade deals is not enough? The key to American prosperity in this new era of populism is for moral people to make responsibility matter again by renewing personal virtue and form lasting, mediating institutions that will trump the elitist bogeymen and scapegoats for generations to come. If we fail as individual Americans to address this core crisis of responsibility, we have only ourselves to blame for what happens next. "Only when the great mass of people reawaken to their civic duties will they be able to wrest control of America from an elite that has shown its failure to lead again and again. David Bahnsen's new book is the first step along this important path." "David Bahnsen outlines cultural, economic, and political remedies for an ailing America of all classes. His often-autobiographical message is that our fate still rests in our own hands. We are not pawns of global determinism, but with a few basic collective reforms and a return to individual self-reliance instead of our current self-obsessions, we can rebuild a prosperous, fair, and dynamic American culture and civilization. An outsider/insider message of hope and renewal that is now as rare as it is needed." "David Bahnsen has written a bracing and incisive critique of our increasingly pervasive culture of victimization. He makes a compelling case that it's still within our power, and absolutely necessary, that we help ourselves. You will enjoy and profit from this book." "When will we put our fingers to better use than pointing them at each other or thrusting a middle one into the air? David Bahnsen shows us how to use our hands and brains to improve housing, education, labor markets, tax policy, and more." "In any debate, the one who controls the narrative, wins the day and David Bahnsen is about shifting the narrative on discussions related to doing well and good at the same time. Bahnsen has undertaken this herculean task in Crisis of Responsibility by combining his economic and financial acumen with his moral clarity in a manner that is neither didactic nor preachy. See if you don't agree." "Markets are living moral creatures, as David Bahnsen notes. The world has been waiting for someone from finance to address the moral aspect of the 2008 crisis. Dave 'Moral Hazard' Bahnsen delivers it." "The philosopher Johann Herder once defined culture as 'the lifeblood of a people; the flow of moral energy that keeps a society intact.' If that analysis is correct, then we can respond that our society has been definitively exsanguinated. For this reason, I am so glad David Bahnsen's book has made its way to the public—for such a time as this. From Wall Street to Main Street and from tech to trade, Bahnsen diagnoses the fundamental problem that ails us and prescribes the only possible cure. He chronicles the decline of individual responsibility while simultaneously offering concrete proposals to bring it back to the nation." "In his thought-provoking, brilliant new book, David Bahnsen brings to light, in an easy to read style, the necessary components for building and maintaining a prosperous and moral society. Personal responsibility, opportunity, and limited government are cornerstones for success for all Americans. It is a must read." "Bahnsen has produced the quintessential counter-narrative to both the 2008 financial collapse and the 2016 presidential election. The theme of both individual and institutional responsibility was a major driving force behind the founding of our nation, and it was a guiding principle until at least halfway through the 20th century. Its evaporation in recent decades has dramatically altered our culture. Bahnsen exposes this crisis and shows us the way out of it. I eagerly endorse this book, but I must say that the most telling endorsement is nothing I could say, but rather the author himself, whom I have known for 20 years as the epitome of individual responsibility. This man practices what he preaches. It is principally for this reason that I urge you to listen to his preaching: the more David Bahnsens that emerge, the fewer cultural crises we would suffer." "I found Crisis of Responsibility a remarkable and urgent synthesis of the economic, social, and cultural afflictions of modern America. But I was also heartened by the commitment to solving these problems through common sense and a renewal of individual responsibility. I hope this book finds a large and appreciative audience. It deserves to." "One more thing that I like, there's a good book out by David Bahnsen - it's called Crisis of Responsibility. The book is essentially a treatise on why it is that Americans are avoiding their problems by pointing at one another and trying to cast responsibility for mistakes on one another. If we could get rid of that capacity to blame one another and take some responsibility for ourselves, we'd do a lot better in life. Check it out!" "Wait until you read what David has to say... David shows that the financial crisis was more complicated than just blaming Wall Street... It was the first time I had heard this narrative – it was exciting to learn something new – that the greed was across the board. He gets to the moral roots of America. American self-government within the gift of democracy is needed for the whole experiment to work – It is about the culture. It thrills me someone of David's stature is writing about this. It is a blockbuster that gets to the core of our problems... This is genius, brilliant stuff." 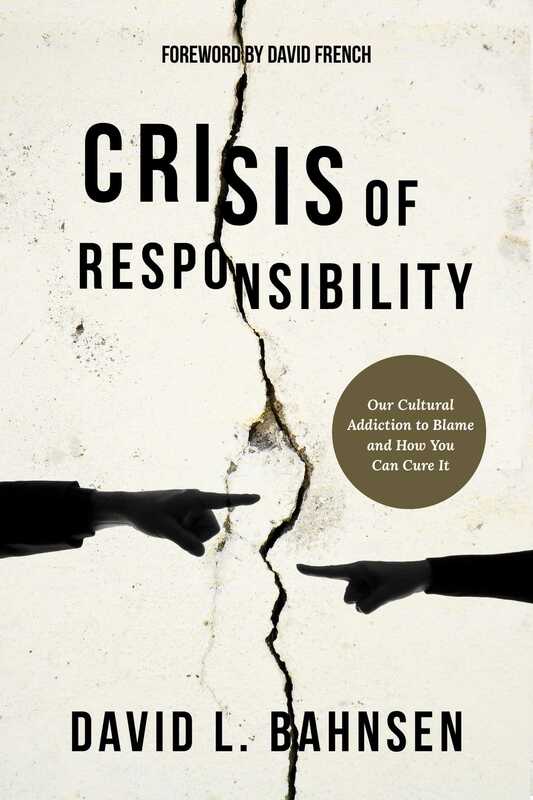 "If you're looking for answers as to what happened to my country, how did we get here, what do I do about it, and how do I change my life and my circumstances, there is a must-read book called Crisis of Responsibility: Our Cultural Addiction to Blame and How You Can Cure It. In business school, they don't teach [Adam Smith's] Theory of Moral Sentiments, but David's book is really a new kind of moral sentiment. What we're going through right now is a reflection of what we have allowed ourselves to accept or become over a very long period of time. We have to fundamentally change for the system to change. It is really, really fascinating, and really well-written. Crisis of Responsibility is a must read." "It is refreshing to read a book by a conservative who by and large avoids the pratfalls so many other members of his tribe have succumbed to. A couple potshots at media elites, I am happy to countenance, as long as they are an amuse bouche portending more serious fare. And that fare does come, largely in the vision of a society in which we demand as much of ourselves as we do of our elected officials and corporate leaders."